A Public Interest Litigation was filed today in the Delhi High Court seeking removal of social activist Anna Hazare from the panel of drafting committee of Lokpal Bill alleging that there are charges of corruption against him relating to the trust run by him. The PIL states that Anna Hazare was held guilty by former Supreme Court Judge Justice P B Sawant who was heading a judicial inquiry against him, and ruled that Hazare had misappropriated Rs two lakhs from Hindi Swaraj Trust run by him. The petition, filed by an NGO , National Anti-corruption Public Power, alleged that misappropriation of fund had occurred during the celebration of Hazare's birthday at his village Ralegaon-Siddhi in Maharashtra. An inquiry was held by Justice Sawant who in his report submitted in 2005, held Hazare guilty of misappropriating Rs 2 lakh from the Hind Swaraj Trust which amounted to corruption, Justice Sawant had held. 'The inquiry was held by a commission headed by Justice Sawant which after detailed inquiry submitted its report in 2005 saying that Hazare was indeed guilty of corrupt practices (involving misadministration of one of his trusts),' the petition said. The PIL alleged that according to the Commission's report, some of the workers of Hazare's Bhrastachar Virodhi Janandolan Trust were abusing the platform for anti social activities such as extortion of money and blackmailing. The Commission to inquire against Hazare was set-up in 2003 on the plea of certain ministers against whom Hazare had opened a front to expose their misdeeds. 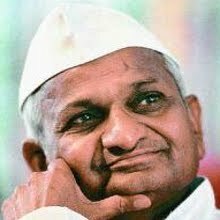 The Petitioner has filed certified documents to prove that there were corruption charges against Hazare and also one of the trusts (Hind Swaraj Trust) of Anna Hazare is un-registered but he has shown it to be as registered long back and has been receiving money illegally, claims the NGO president Hemant Baburao Patil. The petition also claims Hazare was once prosecuted and sent to jail by a minister in a defamation case though he was released within one day. However, no details of the case have been mentioned in the petition. Anna Hazare's out of ordinary rhetoric is in stark contradiction to the established laws of India. He has tried to done the role of legislature, who under tremendous public pressure was forced to give in to his antics by delegating him and his other corrupt co-members a chance to legislate. This precedent is catastrophic as it may open flood-gates for any ordinary citizen to sit on a fast and get his/her demands, whether justified or not, implemented by the government. and on top of it, all the four members of the Civil Society group have a tainted background. If the society cannot find people of impeccable moral standards, it should back-off and let the legislature of the country do its job. A vast majority of people in my India are fasting ;sometimes for 1 day somtimes they skip one meal , simply because they cannot afford it.Like drinking we must also accept corruption as a natural practice ; till some saint with absolute clean record no case/charges arrive as our saviour. Let GOD himself try it. Let LOKPAL Bill come from heaven ,lets have PARLOKPAL BILL because we will dig dirt on anybody . Anna Hazare Supporters comes to India Gate with fire lights and candles in hands. Why we are taking about 220000 always which is spent on anna's birthday. It doesn't make any difference on our pocket but what abt crs of rupees which gone missing, never came to us in any form, have they filed any PIL??? I agree with the first comment that this is a catastrophic precedent. I seriously hope no lasting damage occurs due to this reckless action. I would also like to add that in the name of upholding democracy, they are only subverting the whole democratic process by trying to become supreme than the parliament. It is either plain stupidity, or hypocrisy. I suspect its the latter, because there are a lot of people who understand the nitty-gritty of law making in Mr. Hazare's team. I understand the anger against corruption, but I do not understand how that automatically qualifies Mr. Hazare's actions as correct and valid. For people above who claim that the allegation against Hazare is small compared to that of the govt: It does not matter whether it is small scale or large scale corruption. A person who claims to represent a nation in its movement against corruption, it is a matter of common sense to expect him to not be involved in corruption of even 1 Rupee. Just because the govt is indulged in large scale corruption does not validate Anna Hazare's corruption. Long live Kurta Revolution!!! Long Live Anna Hazare!!! Anna wants to come in limelight, he is just trying to blame the Upa govt, what has Bjp done all these day. Now the congress is doing good. Anna is targeting them. Where are the funds coming from to support Anna, the opposition party is providing it. The people in politics think of only themselves and no other.Where he was when there were Gujrat riots and people killed in the name of religions. There are many more important issues which need to be solved. Anna you are just after the congress govt and thats the fact. What abt d Irom Sharmila Chanu??? ?....She has been fasting for the past 11 years and barely anyone knows about it.People are hell-bent on changing the ‘anti-corruption movement’ into ‘anti-government movement’, transforming Ramlila Maidan into a Tahrir Sqaure, but an actual ‘anti-government movement’ goes unnoticed.Why?....Because Is she not sponsored by any political party??? Why we r entertaining dis ANNA??? Who just sell him as a brand(because he has changed his name KISHANJIBABURAO 2 ANNA)......Does dis movement has any effect in Indian Villege?? ?....When 5 states are flooded situation,people r dying dere, then MEDIA is only interested into a person who is refusing 2 take d food.....dis is a typical Indian culture.....where students r demanding to give them permit 4 cheating in exams...is dis not a corruption???? its a great development..... !!! Why we people are not considering the fact that such a old person is devoting his life for the nation who is not having wife and childs, Sathio its very easy to make the allegation but its my appeal to the appellant and others that if really you want to unearth the corruption scams than see scams occurred in lakhs of crore, dont blame the honest person..Really its shameful.......................B S Makar, Advocate, Chandigarh.